Casa Villa Martínez offers gastronomic services (dinner and breakfast). 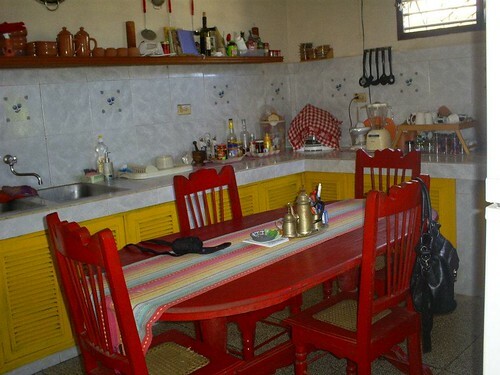 It also offers laundry facilities, taxi reservations to many places in the country, guided tours and reservations to other rooms (casas particulares) in Cuba. 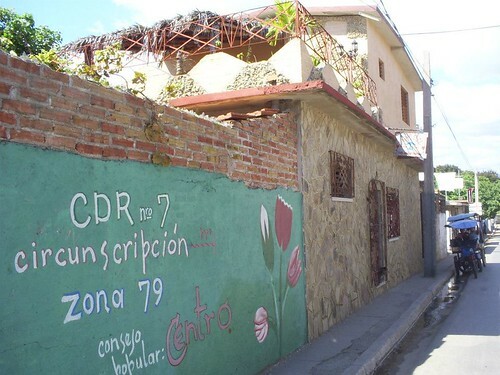 Location: Carretara a Hotel la Ermita, número 12 entre 5ta y 1ra rpto La Salvadera. Two rooms with air conditioning, bathroom (hot and cold water 24 hours), breakfast and dinners (international and traditional food). Viñales, a set on Flickr. We offer tours to the mountains, horses and a variety of wonderful things. The house has a beautiful view to the mountain and it is very comfortable. Villa Maria is a family home, situated in the beautiful city of Ciego de Avila 100km away from the gardens del Rey archipelago and just 700m from the “Parque de la Ciudad” which is surrounded by an artificial lake, “la Turbine” lake, with boating available, children’s playgrounds, and good eateries. Betsy, its owner, is a friendly Cuban lady committed to the wellbeing and comfort of her customers. She rents two air-conditioned rooms on the second level with separate entrance and absolute privacy; with direct access to the terrace which is furnished to receive visits in all areas, with board games and a grill if customer wants to make his own grilled over charcoal. 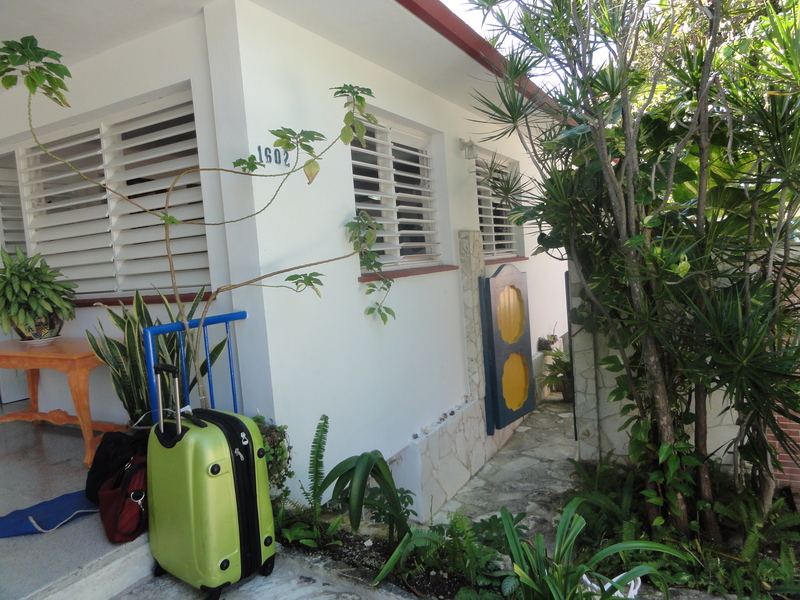 Welcome to Casa Larabi in playa Rancho Luna located at 200 m from Hotel Faro Luna and 20 Km from Cienfuegos city in Cuba. 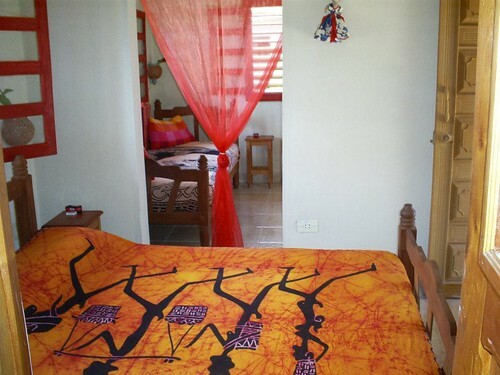 Casa Larabi is one of the best lodgings private house in playa Rancho Luna and the traveler’s best choice. The following video was mede to show the accommodations and the activities offered by our house. The house has 4 spacious bedrooms in colonial style. Each bedroom has its own private bathroom. All bedrooms have air conditioning. A huge dining room, a big garden and two terraces with sea view. A luscious breakfast, lunch and dinner can be arranged based on the Mediterranean cuisine using olive oil. Different cheeses are made in the house from our goats and cows’ milk that we offer to our guests. Dolphins in a natural park within 200 m from our house with Veronica Larabi, diving and snorkeling in one of the most preserved coral reefs of Cuba, visiting the UNESCO world heritage site of Cienfuegos with Leticia (speaks fluently English) and learning how to make cheese from the milk of our goats and cows with Dimi Larabi and Dr Larabi. Make your reservation filling the form on the right for Casa Larabi. Independent apartment with two separate bedrooms ( each bedroom with 2 double beds), one bathroom, kitchen, refrigerator, air conditioning, pantry and terrace. 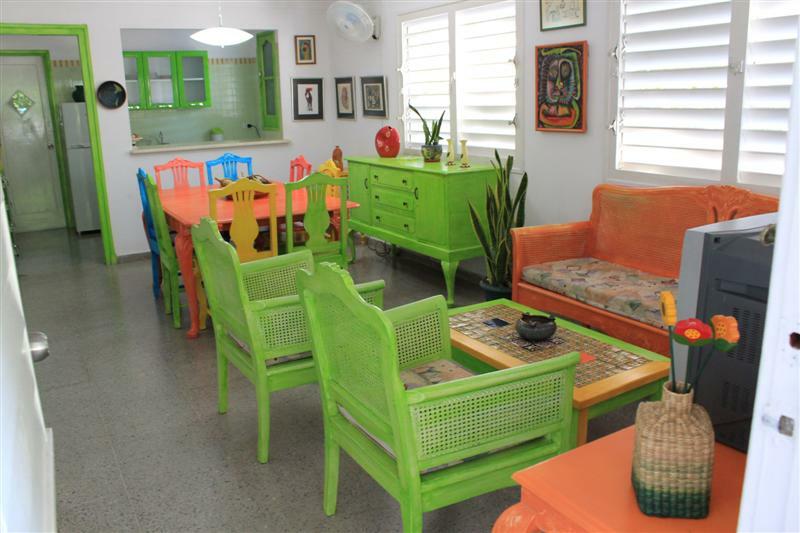 Casa El Tulipan is one of the best options for your stay in Trinidad. Bernardo, the owner of Casa El Tulipan is married to the Dutch Marga and both live on the ground floor of the casa particular. They rent an apartment on the top floor with your private entrance and own bathroom, kitchen, living room and fantastic huge rooftop terrace from wich you have a view over Trinidad and can peek into the Trinidad street. Really a unique casa for Trinidad. Marga and Bernardo are great and very helpful people. 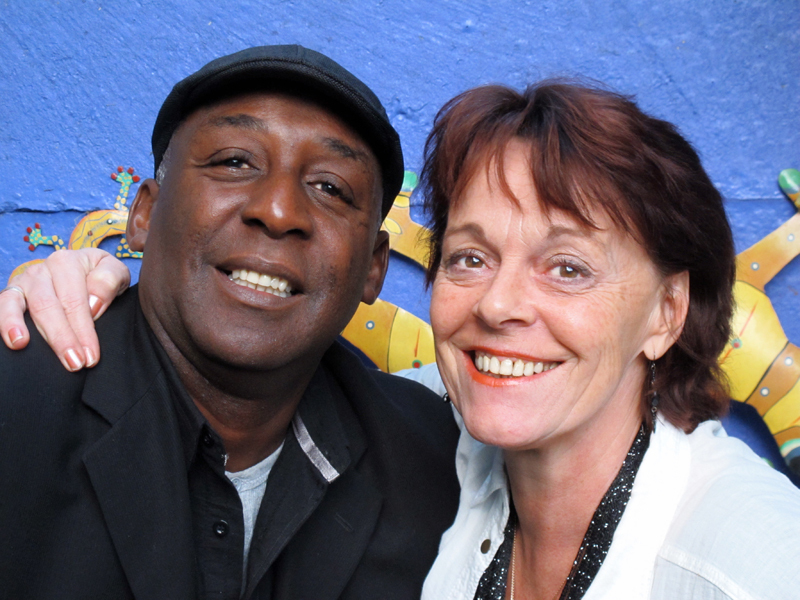 Bernardo can organise salsa lessons, horseback riding through the mountains and other tours for you while Marga will be the one to teach you all about the surroundings and can help you with finding the best restaurant in Trinidad, and much more. We are a bed & breakfast and serve your breakfast daily on the sunny terrace. We work together with our neighbours who have a beautiful restaurant, El Ranchon. They serve the meals their speciality is fish stuffed fish with shrimps and lobster. We can arrange Spanish lessons. A intense Spanish course of two hours per day, one hour lesson and one hour in practices where you will get a tour along the city of Trinidad. The teacher is specialized in communication courses for foreigners. Het huis van Danis in Havana, a set on Flickr. We offer accommodation in the center of the City of Havana, in front of the Havana Libre hotel and very close to Coppelia (big ice cream shop). In our house you will have the opportunity to enjoy a careful attention. 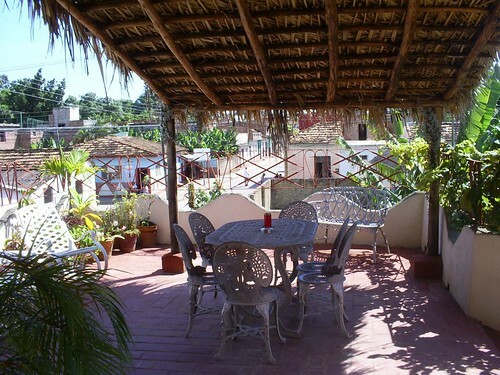 Since the house is at walking distance to the malecon (sea) you can enjoy the view of the coast of Havana. 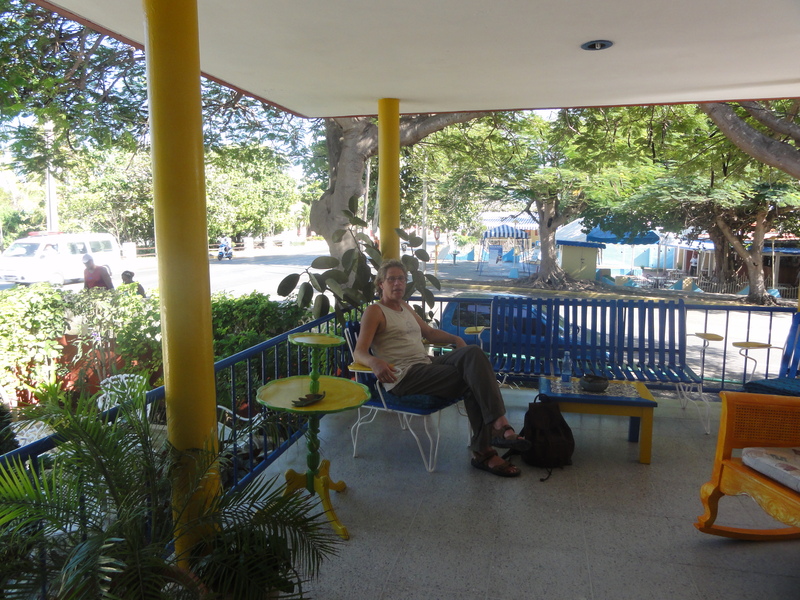 Within a few meters there are shops , reataurants, an international pharmacy, an art gallery and a library where you can find very good titles of Cuban books and world literature.